AARON MATE:	It’s The Real News, I’m Aaron Mate. For many, the shock of the 2016 US election has not yet worn off, and major stories like the Trump/Russia investigation, and now the firing of James Comey, keep that historic campaign fresh on our minds. At a recent event, Hillary Clinton gave her most extensive explanation to date for her loss to Donald Trump. HILLARY CLINTON:	It wasn’t a perfect campaign. There is no such thing, but I was on the way to winning until a combination of Jim Comey’s letter on October 28th and Russian WikiLeaks raised doubts in the minds of people who were inclined to vote for me but got scared off. AARON MATE:	Well, a new book offers a different take on Clinton’s loss. It’s an inside, extensive account of the campaign’s struggles and that starts with the failure to hone Clinton’s core message, including even her reason for running. 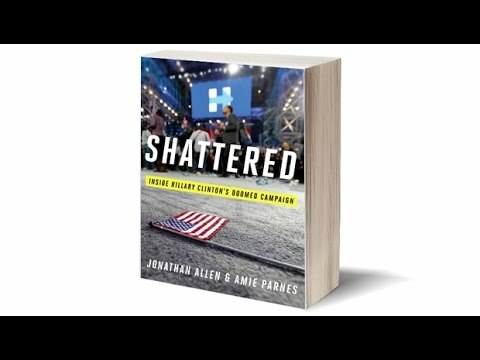 The book is “Shattered: Inside Hillary Clinton’s Doomed Campaign,” and I’m joined now by one of its co-authors, Jonathan Allen, a columnist for Rollcall. Jonathan, welcome. JONATHAN ALLEN:	My pleasure to be here. AARON MATE:	There are a number of revelations in your book, but I’ve got to say the one that I was most shocked by was your reporting that the campaign couldn’t come up for a reason for Hillary to run. That’s just shocking. Can you talk about how you found that out and what you found? AARON MATE:	He’s joking when he says that? JONATHAN ALLEN:	No, he means it. He means that it was not clearly defined even to the people who worked for her why she was running for President. The very simple thing, the one big idea or set of small things that fit into the same sort of bucket of why voters should look to Hillary Clinton now as the person who can lead the United States forward and provide the kind of change from the status quo that voters were looking for. AARON MATE:	And yet, the struggled so hard over policy, they focus grouped everything, tweets were extensively debated. Why was it so difficult to come up with a core message about why the candidate was running for President? JONATHAN ALLEN:	In some ways, I think it was over saturation of policy. This is somebody who sat down before she even really launched her campaign and worked out a whole set of policy ideas with her advisors, and I think she tried to build a message from all of that policy and tried to put some glue in between all of those things. Amy and I have said before that in the campaign headquarters, there was a wall that said, “Hillary is for” and then there were Post-it notes all over the place saying, “Hillary’s for the economy. Hillary’s for debt free tuition. Hillary’s for X, Y, and Z,” and the thing that somebody said to Amy was if you’re for everything, you’re for nothing. I think that was the problem. If you look at Bernie Sanders or Donald Trump by contrast, each of them had a very easy idea to understand. For Bernie Sanders, it was that money and power should be moved away from the wealthy and toward everyone else. For Donald Trump, it was his brand of nationalism, cracking down on illegal immigration, building a wall between the United States and Mexico, coming back from foreign engagements and included in that, rewriting or canceling out trade agreements. It was pretty easy to figure out what those two guys were about, and most of their other policies fit into those ideas. With Hillary Clinton, there were a million scattershot policy ideas, and she’s certainly a master of those details, but it was hard to really define what she was about in a simple and easy for voters to swallow way. AARON MATE:	There’s a really striking anecdote that you have in the book where Hillary Clinton is speaking to a close advisor and she says, “I don’t understand what’s happening with the country. I can’t get my arms around this.” How was it that someone who was so experienced in politics and so well versed in policy and what’s happening in the country couldn’t understand the prevailing anger with the political and economic system? JONATHAN ALLEN:	It’s really a telling moment in this campaign. Hillary Clinton has been walled off from regular people for lack of a better term, for quite a while, as Secretary of State, as a senator, as First Lady. I think she could tell people were angry but I’m not sure she was ever able to really get why or certainly was not able to offer them something that made them believe she was willing to break down the system rather than trying to change it subtly from within. AARON MATE:	Let’s hone in one one state where this dynamic plays out, Michigan. I first want to play a clip from Donald Trump during the Republican primary where he predicted that he would take Rust Belt states like Michigan. Here he is. DONALD TRUMP:	With me, I add a lot of states that aren’t even in play for anybody else. I mean, I add all of the Rust Belt states. I own states that … I will get states that are unbelievable, that are unthinkable for the Republican party. AARON MATE:	That’s Donald Trump saying he’s going to win Rust Belt states, and low and behold, he does, including in a place like Michigan. Jonathan, your book goes into detail about how the Clinton campaign handled Michigan and another one of your astonishing revelations is that the campaign decided that they didn’t want to contest in states like Michigan where they felt the more attention Hillary got, the more attention they’d call to the election, and the worse he chances would get because her message just wasn’t reaching voters. Can you talk about this? JONATHAN ALLEN:	It’s really astounding. During the primary, she and her husband were sent to population centers, to Detroit, to Flint, and not so much into the suburbs where you had white working class voters, and the more her … This is according to the people we talked to for the book, this is according to campaign staffers and people around the campaign. The more she went and focused on voters in cities, particularly African American voters and Latino voters, she ended up alienating some of the white working class and her message wasn’t resonating with them. They cared about three things: trade, trade, and trade, and her position on trade was much more nuanced than that of Bernie Sanders or that of Donald Trump, both of whom were basically just opposed to it. After the Michigan primary, her team decided that it really wasn’t helping her to get extra voters at, particularly extra voters in the white working class suburbs outside Detroit, and so they decided that they really didn’t want to send her to Michigan, because they believed that the more she showed up there, the more people would be aware of the election, the more people who were loosely affiliated voters would actually show up and that that would be bad for her. She mostly stayed out of Michigan for the general election. I think she made a trip to Grand Rapids right at the end, but it’s kind of the same reasoning for them not having gone to Wisconsin at all. JONATHAN ALLEN:	There were a ton of people on the ground in Michigan telling the campaign that they needed to do just that, and also that they needed to show up and that they needed to try to persuade people. The campaign manager, Robby Mook, had basically given up on traditional methods of persuasion, so instead of trying to persuade people who didn’t agree with her, he spent all of his time and energy and money on trying to find people who already agreed with her, getting them out to the polls. That didn’t work in a lot of states. You could see huge follow off from Democrats in particular areas of the country, 70,000 fewer votes in Milwaukee, for example, in 2016, compared to 2008. They gambled big on turning out the base and abandoning persuasion, and those who defend that decision, they can say, “It was hard for Hillary Clinton to persuade people after all this time in the public eye.” There weren’t very many people, they thought, who could be persuaded, who were on the fence or even mildly opposed to her. AARON MATE:	That’s one of the fascinating things that I learned from your book, which is that the Clinton campaign approach is not to try to reach people to persuade them and try to speak to their concerns, but just to mobilize those who they feel were already on their side. You mentioned Robby Mook, the campaign manager. Let’s talk about his approach a little bit. Instead of trying to reach people with policy, he focused heavily on data analytics. Can you tell us about that? JONATHAN ALLEN:	Sure. I mean, data analytics actually means a whole lot of things, but one of the things it means is they’re essentially slicing and dicing the electorate, trying to figure out what the most efficient way is to reach voters, trying to figure out which voters are with them, how they can find all the voters who agree with them and mobilize them. They also learn about what’s most effective in terms of television advertising or on the ground efforts to get people out to the polls. Mook was obsessed with efficiency, he was always concerned the campaign was going to run out of money. They raised a billion dollars and still always felt like they were on a shoestring, so he thought that it was most effective to try to get people to turn out because it cost less money, and also because he believed it was difficult to persuade voters to come over to Hillary Clinton. JONATHAN ALLEN:	Yeah, I mean, this was a long running point of tension between President Clinton and Mook, and Hillary Clinton went with her campaign manager over her husband. Bill Clinton kept telling them, “You’ve got to get out there, we’ve got to talk start talking to people, we’ve got to acknowledge their anger and their fear,” and we saw that a little bit with President Clinton in October when he said that Obamacare is the craziest thing, and was basically talking about some of the premium spikes. People were feeling that all across the country, the campaign wasn’t really acknowledging it, I think in large part because they didn’t want to separate from Barack Obama or separate from the democratic orthodoxy which is that Obamacare was essentially perfect. Might need a tweak here or there, but really wasn’t [inaudible 00:11:18] and problematic. Bill Clinton got his knuckles wrapped by the campaign. They said that this was a mistake on his part, when in fact it sounded like he was just talking to voters in the way they thought. AARON MATE:	Another way to reach voters could have been picking a Vice Presidential running mate who would appeal to the concerns of the working class more than Tim Kaine. You write that Elizabeth Warren was considered for this role, but ultimately was rejected. What happened there? JONATHAN ALLEN:	One of the revelations in this book was that Hillary Clinton was very upset with or disappointed in her shortlist for Vice Presidential candidates, which included Kaine and Agriculture Secretary Tom Vilsack and New Jersey Senator Cory Booker, and she was looking to shake things up a little bit, looking to put a little magic on her ticket, and she started talking to Elizabeth Warren more. She sat down with Warren more, went out on the campaign trail for her. There was a little movement inside the campaign for Warren, and ultimately, what we were told by people who were familiar with the decision making was that Clinton decided that she hadn’t enough of a background of transactions with Elizabeth Warren. They hadn’t really gotten to know each other in the political world enough, and I think there was some concern that Warren might get into office and grandstand if she disagreed with Hillary Clinton. Of course, I think if she could go back, she wouldn’t think so much about who was her partner in office, and maybe more about who could get her into office. AARON MATE:	You write about how a major strategy for the campaign was to try to turn out African American voters, both in the primary and the general. This in some ways contrasts with the message that we got from Clinton in 2008, when I remember she bragged about her appeal to white Americans and the white working class during her primary run against President Obama, but for this campaign, she had a much different message and what’s interesting is that she actually started off her effort with a policy speech that addressed the issue of mass incarceration. Let’s go to a clip of that. AARON MATE:	Jonathan, this was obviously a big issue for the Clintons. They faced a lot of criticism from Black Lives Matter activists because of Bill Clinton’s policies, overseeing an expansion of mass incarceration, also gutting welfare. It was striking that this topic of criminal justice reform was the Clinton campaign’s choice of topics for her first major policy speech. My question is, to what extent did this reflect an actual ideological shift on Clinton’s part? To what extent was it simply just polling, them trying to reach a base that they hadn’t reached before, especially in 2008? JONATHAN ALLEN:	I think it’s important to remember that during Bill Clinton’s presidency he was working with a Republican Congress so not all of these things were his policies. You mentioned welfare reform, I think he vetoed welfare reform two or three times before he signed it. The crime bill had provisions he liked, provisions he didn’t like, but no doubt he was somebody who was a tough on crime candidate in the early ’90s or tough on crime President in the early ’90s, and Hillary Clinton had some words that came back to bite her. I think she understood after watching Barack Obama in 2008 that if you could get African Americans to vote heavily in your favor, essentially as a block for you, that you would be able to win the democratic primary. There’s tremendous advantage in the way the democratic rules are structured to getting a huge constituency like African American voters mobilized, and in high percentages in your direction. I mean, I think she just understood the politics but at the same time, what helped her win the primary, I think during that period she started to alienate, at least this is what people who worked for her said, started to alienate a lot of those working class white voters that she would have needed in the general election. At least one staffer said to me and my co-author, we talk about this in the book, that she might have been better off starting with that base of working class white voters that she had from 2008 and building out from that. AARON MATE:	Let’s go to the issue of emails. Very much in the news right now, with the firing of James Comey and the Trump administration claiming that it was handling of the Clinton investigation, Clinton email investigation that prompted that dismissal. Your book reveals though, actually, a different side of the Clinton email issue which is that after her 2008 loss to Barack Obama in the primary, she got staffers to give her the emails of her staff members to see who had possibly betrayed her? JONATHAN ALLEN:	Yeah. There’s a scene in one of the chapters of the book, I think it chapter four, opens with this moment in 2008 where she instructs one of her tech aides to go out and get the top senior staff emails from the 2008 campaign to look through and to see who was leaking to the press, who was stabbing people in the back. It helped give her a picture for an autopsy she was doing of that campaign, give her a picture of what was going on in her headquarters while she was out on the campaign trail. What it shows is that she’s somebody who’s very knowledgeable about information systems. I don’t mean that she’s going to be hacking into anyone’s computer, or that she’s even particularly familiar with her own devices, but she understands how information moves. She certainly understands how vulnerable you can be if someone else is reading your email, which goes to that question of, “What was she thinking when she set up the private email server?” Which would have, if not found, would have precluded people from getting her records as Secretary of State. Ultimately it was discovered and there were lawsuits, and her email came out anyway, so if that was her intent, it certainly backfired. AARON MATE:	This book in my mind is not just about one candidate or one campaign. It offers striking lessons about our political system. After covering this campaign so extensively, speaking to more than 100 people, what do you think are the main lessons from your book about how our politics work and how future campaigns should be run in light of all the mistakes that you detail were made in this one? JONATHAN ALLEN:	Number one, it’s mostly about the candidate. You’ve got to have a candidate who bridges the divides within your own party and is able to reach out to the other party. That was not Hillary Clinton. Number two, you’ve got to have a candidate who has a message that’s clear and easy for the electorate to digest about why they should be President, what they’re going to do with the awesome power of the presidency, and it’s got to be succinct. Number three, we live in a time of increasing data and we’re always trying to slice and dice people in terms of trying to sell things to them, in terms of political campaigns, but the truth is in politics, victory is equal to both science and art. The art of persuasion still matters in politics. You’ve got to be able to go out there, talk to people who don’t agree with you, and if you don’t win them over to vote for you, if you don’t make them agree with your point, you may at least win their respect. AARON MATE:	Jonathan Allen, the book is “Shattered: Inside Hillary Clinton’s Doomed Campaign,” and it’s now a best seller. Jonathan, thanks so much.